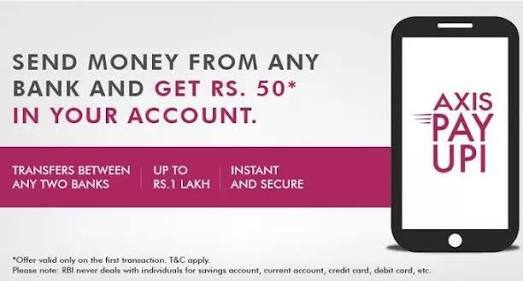 Download Axis Pay UPI & get Rs 50 on your first Transaction. Firstly Link your bank account & send money to anyone instantly. Offer valid for First time user who Downlaod, Register and make a Transaction between 21st January to 31st March 2017. User should have send money for the first time to a VPA contact or an IFSC contact. How to Get Axis Pay UPI App Rs. 50 Credit on First Transaction? • Open App > Giver permission to send SMS from Number which is registered in your Bank account. • After Sign up click on “+” button from bottom right on Home page. • Create your UPA email Address. • Done! AxisPay will Credit Rs.50 within a month. YOU CAN SEND RS.1 TO [email protected] to get Cashback Of Rs.50 within a month.! • The Offer is valid for all Axis Pay new users who would download, register and create VPA on the app. • The Axis Mobile banking active user base and Internet banking active user base would be in the eligible base basis the official communication with respect of the offer by email/SMS. • User is required to download, register, login and create the VPA on Axis Pay followed by linking of an account to that VPA and verifying the account during the offer period in order to be eligible for the offer. • Only first transaction from the user’s app would be eligible for the offer. If the user is already registered and has done transactions before, such user wouldn’t be eligible. If the • user is already registered but performs his first transaction during the campaign period, such user would be eligible. • Valid for All Bank customers.